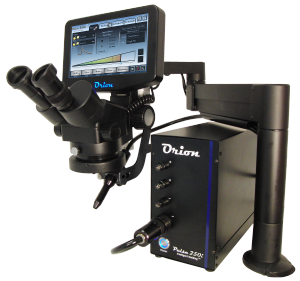 The Orion Pulse 250i is the most advanced micro pulse-arc welding system available and features newly developed Intelligent Welding™ technology. This new technology simplifies the welding process by automatically adjusting weld settings for any metal or application. The Orion Pulse 250i is the most advanced micro pulse-arc welding system available and features newly developed Intelligent Welding™ technology. This new technology simplifies the welding process by automatically adjusting weld settings for any metal or application. In addition, users can experience interactive touch screen navigation, high-frequency agitation for difficult metals like palladium, adaptive weld ignition for longer electrode life, a new multi-pulse setting for laser like welding, and more. The Pulse 250i continues the Orion legacy by providing the most high-tech, versatile, and affordable welding solution on the market today. As with other Orion welders, the Orion Pulse 250i utilizes two different welding technologies – Pulse Arc and Tack. The Tack Mode uses resistance welding technology with up to 200 watt seconds of energy. The Tack Mode is perfect for temporary placement or permanent fusion welding. The Pulse Arc Mode uses pulse–arc welding technology and consists of three distinct energy ranges – Ultra, Micro, and Nano. The Ultra energy range uses up to 250 joules of energy for projects that require deeper penetration or a larger spot size. The Micro energy range uses up to 30 joules of energy and is perfect for moderate penetration and more delicate pieces. The Nano energy range is a new weld setting that offers extremely precise weld energy control from 0.5 – 5 joules of energy, perfect for very fine applications. By using the Orion’s weld modes and energy ranges together, users can experience the most versatile and complete welding system available.